You can look to the left on a stock chart to find support and resistance levels. Stocks will often reverse at prior swing point highs or lows. But what happens when a stock retraces more than 100% of the prior move and goes beyond a prior swing point high or low? What if you can't see any obvious support or resistance levels to the left on the chart? That is where Fibonacci extensions come into play. This stock rallied from $15.45 (A) to $19.77 (B). It then retraced more than 100% of that move to $14.40 (C). Once the stock moved beyond that $15.45 level (the most obvious place for it to reverse) there isn't a support level to the left for it to reverse at. So where will this stock find support? First, you find the range of the prior swing. This is $19.77 (B) - 15.45 (A) = $4.32. Second, you multiply that number ($4.32) by the Fibonacci ratios - 1.272 and 1.618. Finally, subtract those numbers from the prior swing point high (B) to get your possible reversal prices. This stock reversed very close to the first target at $14.40 (C). It was off by just a few pennies. 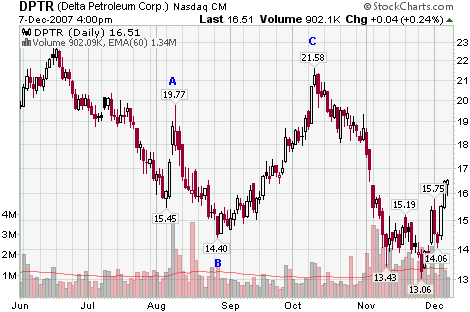 The same stock retraced more than 100% of the move from A ($19.77) to B ($14.40) to end up at C ($21.58). So you do a similar calculation as before to find the resistance level at C.
This time you add those numbers to the prior swing point low at B ($14.40) to find a possible resistance level. This stock reversed very close to the first target at $21.58 (C). Again, were off by just a few pennies. I have seen stocks that have reversed at exactly the Fibonacci extension level that I have calculated. But it's rare. Usually, it will be off by a few cents. That is fine. Once you calculate the Fibonacci extension, look for candlestick patterns to shows signs of a reversal. In this example, you have bullish engulfing pattern that starts the first reversal at support and a bearish engulfing pattern that starts the second reversal at resistance. How would like to do just one search on the internet and find blogs, books, DVDs, Events, News, Pictures, podcasts, and videos about any subject that you type in? Trader Mike has been working on a software agent (robot) called FaveBot ("Favorites Robot") that searches the internet for anything that may be of interest to you. So, for instance, you can do a search for the term "swing trading" and it will return a list of blog posts, books, videos, and even trading events (like seminars) in your area! All in one simple, easy to manage list. So, all I have to do is click on one of those topics and I get tons of videos, blog posts, books, pictures, etc. all related to the topic. You are not limited to the stock market. You could set it up to track your favorite musician, a hobby, or even the 2008 Election if you wanted to. Easy sign up page. Just provide a user name and a password. It's fast. I mean real fast. So easy use a four year old could operate it. It didn't list any "spammy" websites. Up to the minute results. This is a nice alternative to Google or other search engines that only give you the most popular websites on the results page. Instead, this gives you up to the minute results of everything new that has been posted on the internet related to your favorite topic. It's a great tool to keep up with all of your favorite things on the internet. It's the end of December and that usually means a Santa Claus Rally. The S&P has dropped 2 days in a row - buy weakness.